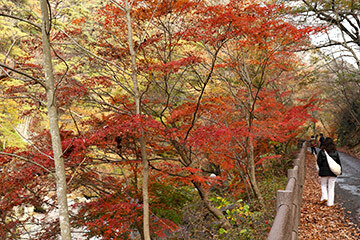 Koyo of Shosen Valley (御岳昇仙峡) is one of the best Koyo, the autumn leaves, spots in Japan. Its landscape scenery is located in Kofu, Yamanashi. It is also chosen as the Heisei 100 best waters. The valley is about 5km long, and it have many beautiful rocks and waterfalls, including Senga Fall, which is the 100 best waterfalls in Japan. Therefore, there are many unique rocks, walls and tunnels which create the art of nature in this valley. If you want to walk all the valley that is takes about 3 hours of round trip, you can park at the lower end of the valley. 1. use local bus to Sengataki, Shosenkyo. Shosen Valley is one of the best scenery of Japan. It has a beautiful Koyo in the middle of November. There is a walking trail that you can enjoy many unique rocks and waterfalls. The view of Shosen Valley is just like the view of deep side of Chinese scenery.